Andaman Property Group Buyers Loyalty Reward Programme with Robert Kiyosaki Live in Malaysia! 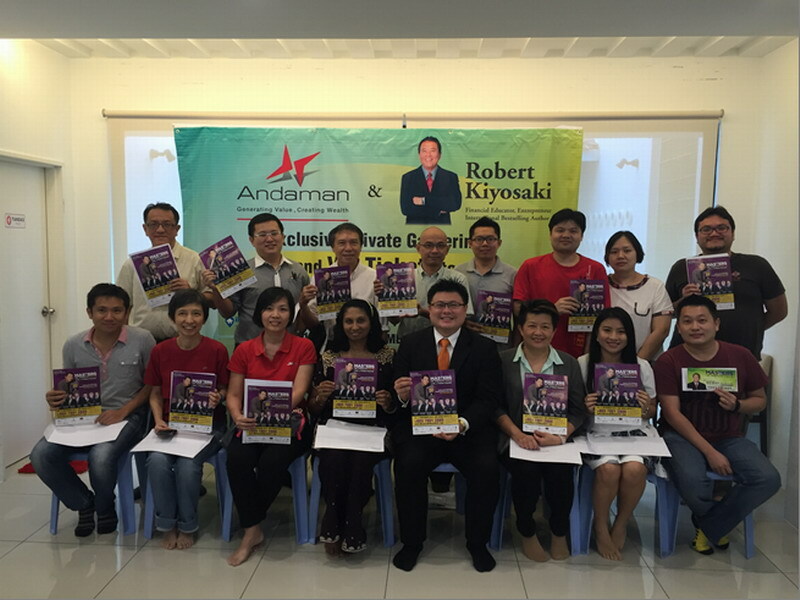 Andaman Property Group continues with their Buyer Loyalty Reward Programme by giving away more than 100 tickets, including VIP tickets to the Masters of Wealth 2015 Live with Robert Kiyosaki wealth seminar in Petaling Jaya that will take place on November 10 and 11, 2015. The lucky recipients are loyal property buyers of Andaman Property Group as well as winners via a campaign which was run on the Facebook page of Dato’ Sri Dr. Vincent Tiew, Managing Director of Andaman Group. Andaman Property Group is the exclusive Gold sponsor of Masters of Wealth 2015 Live with Robert Kiyosaki in Malaysia. This is not the first time that the property developer have treated their buyers to property seminars, conventions and talks. The company believes in truly rewarding loyal buyers, as well as the public, by equipping them with knowledge on up-to-date property market trends, network and options before they plan for their next investment move. Dato’ Sri Dr. Vincent said, “In 2012, Robert Kioysaki met a selected group of Andaman Group property buyers who were mesmerised with the magnificent, truthful, enlightening closed door sharing by Robert himself and wife, Kim Kiyosaki personally. Over two days on November 2 and 3 at Andaman Sales Offices in Johor, USJ and Ipoh, two categories of tickets were given out: 50 Silver tickets worth RM997 each and another 50 pieces of VIP tickets worth RM8,888 each. (ii) Autographed copy of Robert Kiyosaki’s latest book titled “Second Chance”. On top of that, the 50 lucky VIP ticket winners were also rewarded with another 1 hour exclusive private gathering with Robert Kiyosaki. During this exclusive private session, these 50 lucky people get to discuss and ask Robert whatsoever questions on the economy, books he had published or even investment thoughts and strategies. This is an exclusive once-in-a-lifetime private session for all Robert Kiyosaki fans as he seldom grants private session gatherings such as this. For further information or ticketing enquiries, contact: +603-78012888. 13 Responses for "Andaman Property Group Buyers Loyalty Reward Programme with Robert Kiyosaki Live in Malaysia!" Nice to see Robert going strong even though his company’s in trouble. That sounds like a good event to attend. Its always motivational to attend such courses. Wish I can attend! T_____T I love to read Robert Kiyosaki’s books! nice info for those that interest to attend. It’s Nov now so need check schedule as well. Great info! Definitely need multiple sources of income during this down time! 😉 thanks for sharing yo. Robert Kiyosaki wrote such amazing inspiration for people who’re looking help in finance. It’s so good to see him. Wish to meet him in person. A good way to reward back to the customers. All Andaman customers must be very happy receiving the prizes. The topic that will be present by Robert is really attract me. As a new buyer or investor, we need to know all the procedure before purchase been done. Wow.. amazing right… getting to meet Robert Kiyosaki and picking his brain for some amazing tips ….